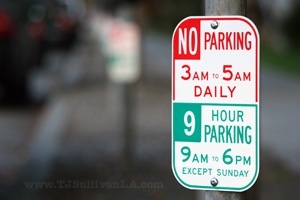 Santa Monica City Councilman Kevin McKeown apparently read Friday's post regarding the 9-minute parking meters on Colorado Avenue, and did not tarry in pursuit of a solution. McKeown sent me an e-mail on Monday morning to say he'd worked with city staff to correct the situation. So, I headed over to the scene of the nine after lunch and, sure enough, the odd time limit had been extended, as evidenced by a couple shiny, new signs (see inset). We recently changed a number of meters on that strip from 10 hours to 9 hours. There were, mixed in, some shorter term meters measured in minutes. Apparently some of the new "9" stickers got pasted onto the "minutes" meters by mistake. Now that's good government, the kind that becomes aware of an error and takes it upon itself to fix the sign. You show me a government that fixes tickets that fast, and I'm there. Next blog post: Oh, no, we’re turning into West Hollywood!